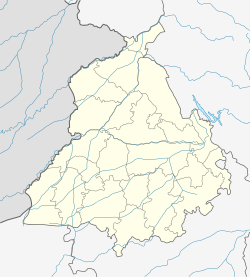 Gardhiwala is a town and a municipal council in Hoshiarpur district in the state of Punjab, India. Khalsa Senior Secondary School is the oldest (built in 1924) and famous school of this town it has given Punjab great officers and players of international level. It is famous for producing great soldiers like Colonel Bachhiter Singh Sahota who laid down his life fighting militants in Kashmir. Late Sh. Som Raj Seth was one of the renowned persons of the city. He served as President of Municipal Council and later on his son Sh. Lalit Seth also served as President of Municipal Council multiple times. Johny Seth is a prominent Punjabi singer. Half of the town now has migrated to the USA , Canada or the UK. People from different religions live here. During partition a lot of Muslims were given shelter by the Seth family and communal harmony was restored. This small town has produced great players of Kabaddi like Mehnga Singh,Chaudhary Harbux Singh and Sohan Singh. Seth family is one of the most famous and well-renowned family and each and every person has done a lot for the betterment and goodwill of the residents of the town. They have done a lot of work in Socio-Economic as well as cultural sectors. This moderate town is a very close-knit community and a business hub for numerous villages around it. Local business ranges from grocery, jewellers, clothing merchants, hardware stores, chemist, electrical and electronics suppliers to cold storage and wheat storage facilities. There are various doctor clinics, banks, and educational institutions. Garhdiwala has its own Police Station and Post office as well. The city has a humid subtropical climate with cool winters and long, hot summers. Summer Temperatures vary from average highs of around 47 °C to average lows of around 22 °C. Winter temperatures have highs of 19 °C to lows of 1 °C. Southwest monsoon season occurs during July and August. Throughout year, average rainfall is 710mm. As of 2011[update] India census, Gardhiwala had a population of 7593. Males constitute 51% of the population and females 49%. Garhdiwala village has a higher literacy rate compared to Punjab. In 2011, the literacy rate of Garhdiwala was 87.24 % compared to 75.84 % of Punjab: Male literacy stands at 92.82 % while the female literacy rate was 81.73 %. This page was last edited on 1 March 2019, at 08:56 (UTC).